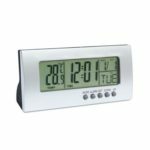 This alarm clock features easy-to-read screen, accurately display time, indoor temperature & humidity and comfort index, all data at a glance. 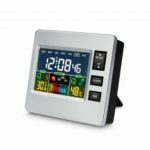 Backlight LCD display give you a more clear view and great to protect your eyes. 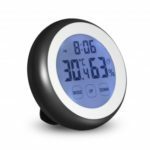 Easy to use and easy to set up, monitor temperature and humidity levels for better health. 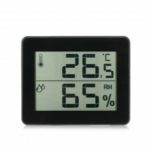 High-sensitivity touch buttons make it easy to operate, all the information you need can be obtained through three buttons, and displayed clearly on backlight LCD screen. 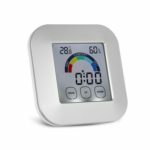 Monitor the temperature and humidity of your house at any time, get max & min indoor temperature and humidity records through “UP” compared to current temperature & humidity. Long press"MODE" to set the time step by step, from 24Hr/12Hr, hour, minute to ℃/℉ switch. Press "DOWN" to set the alarm and the icon shows on the screen. Two magnets on the back can attract on the refrigerator or furniture, it can also stood on the table with built-in support stand. It can be used in various occasions such as home, office, greenhouses, incubation room, nursery room, school, laboratory, baby room, hospitals and other places.